President Trump’s 2016 win upended conventional wisdom about the U.S. electorate. But how much of that win is replicable in 2020? President Donald Trump’s 2016 win upended much of the conventional wisdom about the U.S. electorate to cobble together a surprising victory. But how much of that remarkable 2016 movement is replicable in 2020, particularly with the demographic changes remaking the United States? A new bipartisan report runs through some of the scenarios that would lead to Trump’s reelection or a win for Democrats. 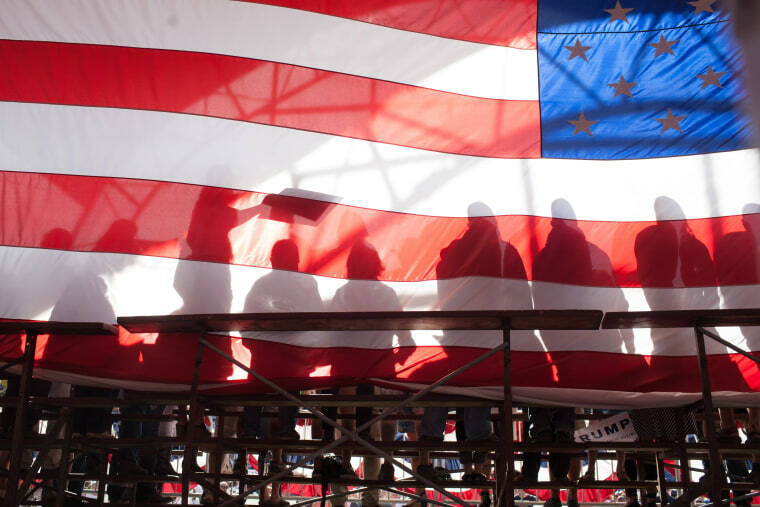 The States of Change report, authored by a long list of groups including the Center for American Progress and the Bipartisan Policy Center, suggests there is a long-term structural advantage for the Democratic Party but a much more complicated short-term picture. Sitting behind the report and the electorate in U.S. general is one immutable fact: Change. Trump’s coalition was heavily reliant upon white voters who did not have a college education and that segment of the population is shrinking, while others grow. By 2020, the report estimates, the percentage of eligible voters who fall into the category of “white without a college degree,” will drop by 2 points, from 46 percent in 2016 to 44 percent. Meanwhile, voter segments that tend to favor Democrats will all grow as a share of the total eligible vote. That includes “whites with a college degree,” African-Americans, Hispanics and Asians/other are all forecasted to climb by one percentage point. But, of course, elections are not just about who is eligible to vote, they are about who comes out to vote and their margins of support – and this is where the 2020 scenarios get interesting. The 2016 presidential map featured six prominent flips from 2012 – states that Trump captured but Republican Mitt Romney did not in 2012: Florida, Iowa, Michigan, Ohio, Pennsylvania and Wisconsin. Some of Trump’s win was about changes in turnout and margin among African-American voters. Turnout among that group of voters dropped by more than 4 points nationally in 2016, according to the report. And the Democratic margin with African Americans dropped to 80 points (yes, you read that right, dropped to 80 points). Democrats won black voters by 88 points in 2012. In this scenario, the Democratic nominee in 2020 would win 339 electoral votes, recapturing Florida, Michigan, Pennsylvania and Wisconsin and adding Georgia, a state no Democratic presidential nominee has won since 1992. In part, that’s due to big growth in the African American population of Georgia. Of course, ginning up that kind of enthusiasm among African American won’t be easy. There will not be a candidate named Barack Obama on the ballot. One pattern of voting change that seems likely to continue and perhaps grow is the role reversal among whites with different levels of educational attainment. “White voters without a college degree” are consistently among Trump’s strongest supporters, while “white voters with a degree” are solidly opposed to him. If those trends grew in 2020, and Trump performs five points better with white non-college-educated voters while also doing five points worse with white voters who hold a college degree, the report finds the net result would look a lot like 2016. President Trump would win reelection under this scenario and actually see his electoral total grow slightly, to 309, by flipping New Hampshire to his side. And that would happen as the Democrats saw their advantage in the popular vote grow to 2.6 points, up from about 2.1 points in 2016. How’s that possible? First, white voters without a college education are shrinking as a percentage of the electorate, but in 2020, they will still make up the single biggest share of voters at 44. And some states have a much bigger share of that group of voters – and this scenario would be enough to keep Trump on top in 2020 and even 2024, barely. However, those kinds of moves in the electorate might not be easy for the president. Trump is a divisive figure on whom most voters seem to have made up their minds, but its not clear what his current low approval ratings would mean in an election. What would happen if all voting blocks essentially voted the same ways they did in 2016, but with these broad demographic changes in place – basically the 2016 vote with the 2020 electorate? On the most basic measure, with the same percentage of votes scattering to various third-party options, the Democratic candidate would narrowly win with 279 electoral votes – remember, it takes 270 to win. But if the third-party vote in 2020 looks more likes its historical norm and those voters go back to their home parties, the report says the 2020 election could yield an extraordinary deadlock. Of course, 2020 is several lifetimes away in political terms. No one knows what the issues will be for the next presidential race or where the economy will be or, maybe most important, who the Democratic nominee will be. The only thing we know for certain is what slogan Donald Trump plans to use. But the point in these numbers is not the actual outcomes. The point is how little it takes to get a different result. Adding a few votes here or subtracting them there could yield very different outcomes in the next presidential race.